Design and construction professionals must understand the Owner’s goals for each project. Determining the Owner’s Project Requirements (OPR) is critical. What does the term “Owner’s Project Requirements (OPR) mean? Simply put, the Owner’s Project Requirements (OPR) are the Owner’s goals for the project – it’s what they want to achieve by performing the project. How will our clients measure success? What result at the end of the project will make our client happy? Design and construction professionals can greatly increase the chances of project success AND client satisfaction by determining the Owner’s Project Requirements (OPR) early in the design process. Some of this sounds pretty obvious – after all, as consumers, we’re all used to communicating our expectations to businesses who want to sell us something. When at a restaurant, we ask for steak at a certain temperature, or maybe a different side dish, and hopefully we get what we want. But that doesn’t always work, even we communicate clearly (or at least we think we did). And if the server never asks how we’d like our steak, and the restaurant serves all steaks well done or rare, the staff shouldn’t be surprised to hear complaints. And I’ll bet some patrons would say they should have been asked how they liked their steaks. The restaurant example may seem kind of ridiculous, but think about it – I’ll bet your favorite restaurants ask you for what you want in clear, can’t-miss terms, and then deliver. In their way, they determined your OPR before getting to work. That’s what should happen on new construction, renovation, and yes, environmental hazard abatement and demolition projects. Too many times the opposite happens on design and construction projects. In this case, we’re talking about projects that cost much more than even the most expensive meal, and the ramifications are serious – private funds, taxpayer dollars, liability, and reputation of those involved. Determining and managing expectations and eliminating lapses in communication are key in defining Owner’s Project Requirements (OPR). We have a school system client that employs a program management firm to assist in execution of design and construction projects. I’ll call them PMF. PMF’s responsibilities include managing the project on behalf of the Owner, and communicating with architects, engineers, and contractors to make sure the projects are successfully executed. They’re well compensated for their work and have almost a blank check to get things done. It’s unclear who works for whom. You’ll see what I mean below. The school system has a building that’s undergone pretty significant HVAC renovations over the last couple of years. The building’s HVAC system has a central central Air Handler Unit and associated piping and infrastructure, while the classrooms have individual air handler units. The HVAC renovations have included installation of a new rooftop mounted unit to supply fresh air into the building. I’m told the air is tempered and dehumidified, and the building is positively pressurized with respect to outside. Hooray! However, the renovations didn’t include looking at the individual units in the classrooms, or at the associated piping/insulation. Corrosion and failed insulation have led to moisture problems and mold on the suspended ceiling tiles in the classrooms and corridor. The new insulation on the new pipe runs also show signs of failure. Chillers and pumps have had some ongoing problems also. To make things worse, there’s no integrated control system between the new units (that supposedly have a sophisticated can’t-miss control system) and the units in the classrooms. On top of this, some of the chilled water system components aren’t working properly, so the building’s new HVAC system can’t control moisture (and I’m not 100% convinced it could), and the school’s custodian and school board maintenance personnel haven’t yet been trained on the HVAC system operation, and there are no Operations and Maintenance Manuals (think of these as the equipment Owner’s manual) for them to use in trying to run the system. PMF says piping serving the individual units was not included in their scope, along with pumps and chillers that serve the system. The school board maintenance personnel are stunned by this statement. Why modify parts of the system, when changes to all of the equipment were necessary to give the Owner a completely integrated system that doesn’t lead to water damaged and moldy ceiling tiles? And why continue to operate a system that can’t control moisture in the building? PMF may have some valid points as to why they’re not at fault, but the Owner is not happy. In this case, it sure appears that PMF didn’t define the Owner’s Project Requirements (OPR) and make sure the new system components achieved the Owner’s objectives. And when PMF noticed problems, they weren’t very responsive in recommending corrective action. Rather, they looked only at their parts of the HVAC system, instead of how all the pieces fit together. So who’s at fault? That’s tough to say, but the Owner has a problem – there’s more work to be done to get the whole system operational. Regardless of who is right, the Owner is ticked off. Not good. So we all got together. I proposed looking at all the system components, including existing piping and insulation, operational status of the HVAC system components (old and new), proposed training for the Owner’s personnel (including videotaped sessions for future playback), Operations and Maintenance (O&M) Manuals, and Testing and Balancing work to get the system dialed in and fully operational. You’d have thought I just invented cold fusion with nothing but duct tape. All those things should have been done in the beginning – if they’d defined the Owner’s Project Requirements (OPR) and…. commissioned the project. In short, Building Commissioning is a way of measuring and verifying that a building (or just one building system) performs as the Owner intended. Or put another couple of ways, it’s a process for making sure the customer (Building Owner) gets what they want, or if you’d like, it’s a process that helps us “Trust but Verify” the project lives up to expectations–you know, the thing actually works as intended. As we’ve come to expect more efficient performance from our building systems and operations, we’ve seen some supposedly high tech, high performance building projects fall flat when checking actual performance criteria. Building Commissioning is usually applied to an entire building early in the project (in the pre-design stage). Retro-Commissioning applies the commissioning process to existing buildings and can help resolve problems that resulted from the building’s design and construction and problems that arose during the life of the building. This process usually improves operations and maintenance (O&M) and enhances building performance. Re-Commissioning applies the commissioning process to existing buildings that have already been commissioned. Ownership change, operational changes, or other circumstances may trigger Re-Commissioning. The long and short of it is there are different types of building commissioning (for the whole building, or just parts) that Owners can select to help them make sure their buildings/systems perform as expected. These are excellent tools for doing just that. >The Design Team understands the OPR and effectively communicate the design and operational requirements to the Contractor. >Ensure success doesn’t just exist on paper–it provides real, measurable data that verifies successful project completion. There are guidelines for commissioning new projects (new buildings), as well as existing buildings. I won’t go into that too much here, but Owners can choose how much (or little) to do. But it’s important to get the commissioning process started as early in the project as possible. Typically, all mechanical systems (HVAC) are commissioned, as well as electrical, Life Safety, building automation systems (BAS), and other special components. This goes beyond just Testing and Balancing work–although TAB is an important part of HVAC systems commissioning. And sometimes the building enclosure (roof, walls, windows, etc.) are commissioned as well. Yes, the enclosure is a building system, and depending on the overall building design, there may be unintended interaction between the HVAC system and building enclosure. The testing, measuring, documentation, and verification part of commissioning is a great way to kick the tires to make sure critical building system components actually work before they’re really needed. The fancy phone app screen may say the backup generator is ready, but the generator may not work when the storm knocks out power. That’s not the time to troubleshoot. If an Owner has had significant roof leaks or HVAC problems, defining the OPR can establish the Owner’s requirements for enclosure performance, or temperature, relative humidity, and indoor environmental quality (IEQ) criteria, and help the Design Team and Contractors understand what frustrations the Owner has experienced. Some things are pretty easy to check and verify – like the picture below. 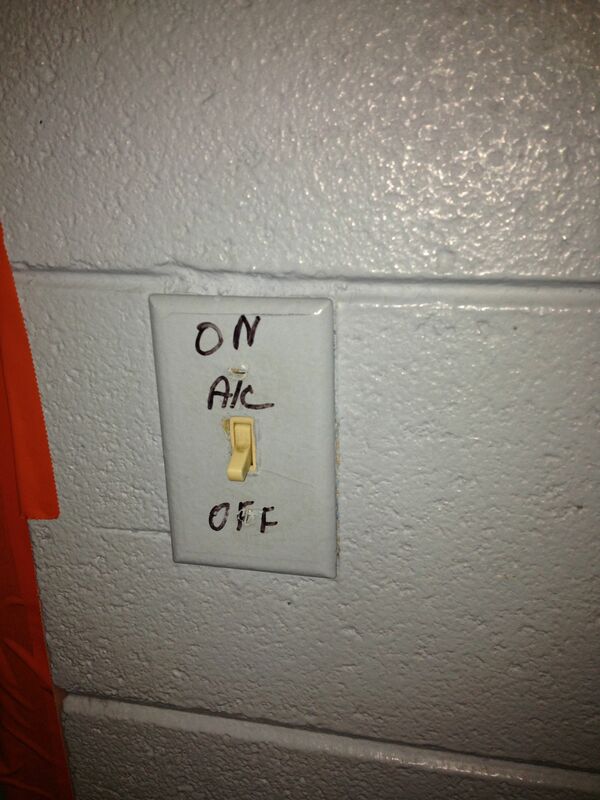 In this case, there’s a pretty low-tech, easy to operate HVAC system control. 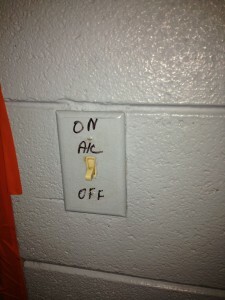 And sure enough, when the switch was in the “OFF” position, the AC stopped running. Ironically (and I thought this was hilarious), this particular building owner had spent big money on an energy management system that allowed control of ALL (at least they thought) of their HVAC systems. However, this unit (and another in the same building) were not included in the energy management system, so the elaborate control you see in the photo is all there was to control the building’s HVAC system. So even though there’s an App for that, the only way to turn the thing on and off was to flip the switch. That’s NOT funny if you’re a building owner who expects real, measurable, verifiable energy savings from the new, expensive building control system. But like I said, I thought it was kind of funny (especially since I didn’t design it). ASHRAE Guideline 0 – is it required? ASHRAE Guideline 0 is a widely accepted standard for the Commissioning Process. I think it’s a well thought out document, and applied correctly, goes a long way in helping make sure the Owner’s goals are met. In many locations, Owners can pick some or all components they want commissioned, but there are jurisdictions in the U.S. where building codes may require building commissioning, and Guideline 0 will be part of that. Or if pursuing LEED commissioning points, expect to see Guideline 0. Typically, the Owner engages an independent third party to facilitate commissioning. This person acts as the Owner’s representative in preparing building commissioning plans, communicating with Design Team members and Contractors, reviewing design documents, evaluating test results and reports, and training of Owner’s personnel in O&M procedures. This person checks as appropriate to make sure the commissioning plan is being executed, and in the end, prepares a report outlining results. The Commissioning Agent (sometimes called the Commissioning Authority or Commissioning Professional) should have appropriate background and credentials in Building Commissioning. Stay trustworthy, my friends. Contact me for a free 30 minute consultation if you have any questions about your buildings.